I've sort of been on an oven strike this month and hopefully for the rest of the summer. It's just too hot! I've been using our crock pot and electric grill. 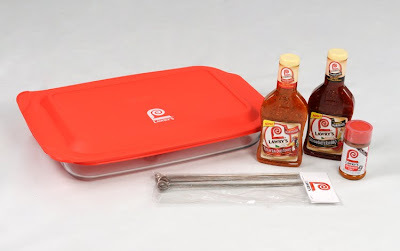 So you can imagine my excitement when My Blog Spark contacted me about this Lawry's giveaway. They sent me two new marinades to try along with metal skewers, seasoned salt and a very nice Pyrex marinating dish with lid. And guess what? You'll get a chance to win this package! Lawry's newest marinades allow you to infuse your meals with exotic flavors without ever leaving your home. Inspired by the sun-drenched villages of Italy, the Tuscan Sun-Dried Tomato Marinade features extra virgin olive oil, sun-dried tomatoes, sweet red bell peppers and the perfect blend of herbs. The Szechuan Sweet & Sour BBQ Marinade gives meat a delicious sweet and sour flavor with a touch of Szechuan heat. These marinades fuel the flames of flavor and are on-point with this season’s hottest grilling trends, adding inspiration to your favorite dishes. Take your family’s grilled dinner to the next level - Try Lawry’s Tuscan Grilled Lamb Chops with Warm White Beans Provençal recipe featuring the new Tuscan Sun-Dried Tomato Marinade tonight! Applewood & Plum – Juicy plums accent smoky applewood and add flair to all-American barbecue. Cilantro & Lime – Cutting across the diverse cuisines, this bright and zingy pair is a refreshing taste of summertime. Rosemary & Fig – Figs are an unexpected and regionally inspired match for aromatic rosemary. Chipotle & Maple – This culinary comingling deliver a fresh take on smoky, spicy and sweet. Brown Sugar & Bourbon – This duo brings a delicious dose of Southern charm to the patio. Cinnamon & Coffee – Bold and confident – with just the right edge of bitterness. Looking for a refreshing summer meal? Treat your family to Lawry’s Tequila-Lime Skirt Steak with Avocado Chopped Salad recipe featuring the Cilantro & Lime flavor profile. leave a comment sharing a great grilling tip with everyone. leave a comment sharing your favorite flavor combos to marinate meat and poultry. This giveaway is open for all US residents until Thursday July 1, 2010 at 6 p.m. EST. The winner will be selected by random.org and have 48 hours to respond to email notification. Please include a valid email address when leaving your comment. My great grilling tip is to make your husband do it! I am scared of the grill! I use the George Foreman, if I want it that bad. Love me some Lawry's though! I don't have a tip, but I like to marinate my food in Dales! I found a recipe online that said Italian dressing and bbq sauce together made a good marinade. We always make sure our meat or veggies are at room temp before grilling. That seems to help seal in flavor and keep them moist. We use a combo of worcestershire, garlic, salt, pepper and olive oil for marinating. We have used Lawry's for a quick change that turns out well every time. The forecasted flavors sound absolutley fabulous. My husband does all the grilling around here, but he likes using liquid smoke, dijon mustard and other seasonings! I don't grill much but I know my husband likes to marinate in Italian dressing sometimes!! I like to use the mojo marinade. Publix has a great store brand that is pretty inexpensive. My husband does all the grilling in our family. Which means a day off of cooking for me. I love anything Lawry's...especially the seasoned salt. We bought a rotisserie for the grill and used it for Thanksgiving turkey. YUM! I like to marinate with Ponzu lately. It's delicious. we love to use the Jack Daniels mesquite marinade in the ziploc bag. Fantastic for chicken or beef!!! My husband is the grill man!!! I like to marinade with citrus juices, galic, cilantro and jalapeno. I always make sure to spray some pam on the grill before putting the meat down. Makes it so much easier to flip. We've used Lawry's buffalo chicken flavor and it came out tasty. My husband does all the grilling - we use a lot of dry rubs & marinades. One of our favorites is the Lawry's Cilantro & Lime with chicken breasts. I love to marinate chicken in BBQ sauce and add ranch seasoning to it! My great grilling tip - make sure you get your husband to love cooking. That way you spend time out of the kitchen! I like teriyaki and pineapple. I love to spray Pam on the grill grates so that nothing sticks to it! I made Chicken Fajitas on the grill last night--so good! I love the flavor combinations in the Cooks Illustrated recipe--lime, garlic, jalapeno, and cilantro of course! Yummy! Thanks for the giveaway. My best grilling tip is always spray the grill with your favorite spray like PAM. My grilling tip is --tin foil...lots of tin foil! My grilling tip is to cook the meat at a lower temp for a longer time, it makes it more tender!